High risk, high reward. This is one way to sum up the Trials of Osiris pulse rifle that came in Destiny: Rise of Iron. The burst firing weapons have become a foundation of the game’s meta since The Taken King released, which had them at their peak. Since then, their usefulness has diminished but has still remained strong when it comes to primary weapons. While the current meta may be more reliant on special weapons, firearms such as these are solid choices for when that shotgun or sniper runs out of ammo. The perks that I was able to get, which I believe is the norm for this weapon, has the ability to be modified for a few different engagement types. The first row of perks has the choice between Smallbore and Hand-laid stock, providing the user with either increased range and stability at the cost of reload speed and magazine size, or increased stability at the cost of even more of a range drop off. I tended to stick with Smallbore due to the need for pulse rifles to be effective at longer ranges, but the lower magazine size can be felt in many engagements. In 6v6 game modes, like Iron Banner this week, I would find myself often facing an empty magazine while there was still opponents from me. Leaving only 21 rounds to work with can provide the user with two kills before having to reload, but any missed bursts will have high costs. However, bursts that do land were able to down my opponents reliably and efficiently. I was fine with taking the risk, putting the ball in my court to move smartly and not rush into fights I had no business being in. The second choice of perks is between High Caliber Rounds or Hand Loaded, and while I started using hand-loaded for the range I found that it wasn’t enough of a jump to be more useful that the extra flinch High Caliber Rounds provide. When playing either Trials of Osiris or Iron Banner, it can save your life to stagger opponents more than they expect. Those few split seconds can win a gun fight more than a slight boost of range, especially since I tend to use Smallbore in the perks before. Counterbalance and Outlaw offer two very good choices, as they both make this weapon even more deadly in tight situations. Typically I would go with Outlaw for the quicker reload time after precision kills, but due to my character using the Ophidian Aspect exotic gauntlet, my reload speed was decent enough already. Having the gun reload a little faster was not worth using over the incredible reliability that Counterbalance provides. Restricting the kick of the weapon to where it is very predictable and easy to control. For me, Counterbalance was the easy choice, but without gauntlets that increases reload speed for either all weapons, like Ophidian Aspect, or for pulse rifles in general, Outlaw is a very strong choice. As with the previous choices for perks, this one comes down to a lot of personal preference and will likely evolve as the gun is being used by the player. I’ve had this weapon for a week now, and I really like it. 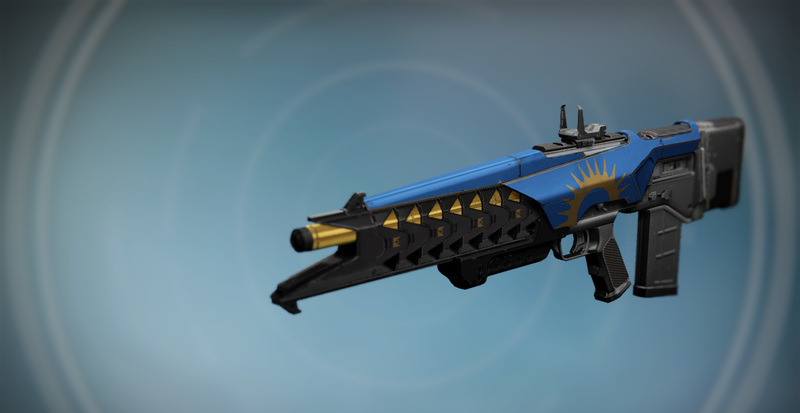 I do not think it will become the new meta, as higher rate if fire pulse rifles still have an advantage in time to kill, but whenever I would either have the jump on someone or have a little bit of a range advantage, the Blind Perdition proved to be quite useful. I’ve been able to reap several multi kills by laying down precise and persistent fire, even when being fired on by several people at once. Once thing that the weapon has in its favor is its red-dot scope. All of the Trials of Osiris weapons for Rise of Iron have scopes which highlight enemies, even through visual restricting effects like Nightstalker’s smoke. These scopes are simply incredible, as they allow for the player to react faster due to less lag between seeing a target and recognizing it. If you see that highlight, you can feel free to fire knowing that you’re aiming at a target. Yet, all of these things that the Blind Perdition have going for it are simply balancing out the small magazine size. Like stated before, for me this weapon is high risk, high reward. There will be no blind spraying, but smart and controlled fire will reward the player with a weapon that proved to be useful to me all week when playing Iron Banner. While I do have a decently rolled Grasp of Malok, I will continue to use the Blind Perdition as it fits my play style more. Yet, I believe that weapons like Grasp of Malok and the new Iron Banner pulse rifle, Clever Dragon, will prove to be more accepted as time goes on. It had been a goal of ours for months. I tend to really enjoy playing the Trials of Osiris in Destiny. However, I also tend to be very apprehensive to start due to my own tendency to feel like I’m not god enough to play and other mental inhibitors. Thankfully, I have a couple of friends who are much better than me and have dragged me into some of the most fierce and enjoyable competitive experiences in any game I’ve yet played. For those who are unfamiliar, the Trials of Osiris is the most competitive player versus player activity that Destiny has to offer. It’s a 3v3 game type, no revives except by teammates, and the only points that matter win rounds, accomplished by wiping the other team. The first team to 5 round wins will come away with the victory, and only teams who can win 9 games without a loss will earn a trip to the Lighthouse on Mercury where some of the most coveted gear in the game will be waiting for them. However, once you hit three loses you will be kicked out and have to start over. Luckily there is some leeway, as three different buffs can be purchased before a run is begun. The Boon of Osiris will make your first game count as two if you win, the Favor of Osiris will allow you to begin with a win, and the Mercy of Osiris will forgive the first loss. So in effect, if you win the first match you will start with three wins and have to go at least 6-1 in order to succeed. Definitely easier than going through the full nine without a failure, but still daunting to many of us, especially since the matchmaking for Trials since The Taken King expansion last year will try to match you up with players that have the same amount of wins. The final game, if the system works as it should, will pit two teams that both have 8 wins and most likely are competing for the Lighthouse trip. When it comes to Destiny, I have become a bit of a completionist. I’m not as dedicated as I once was, work and other life responsibilities have taken up a large chunk of my time. 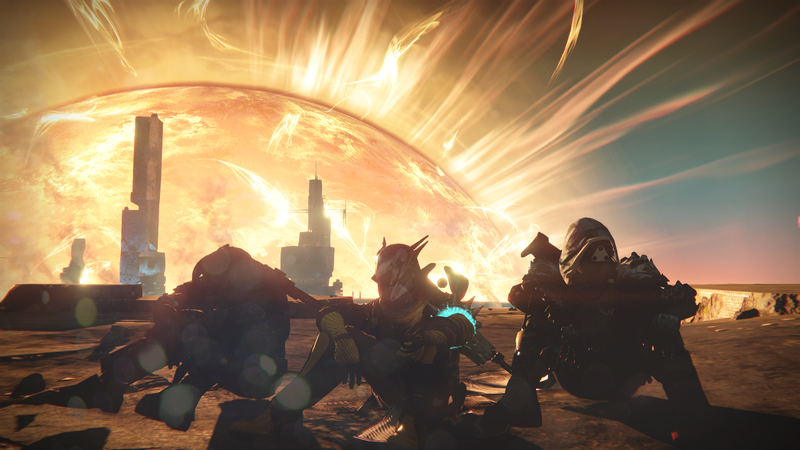 but Destiny has remained my go to when I am able to sink some hours into something I love. However, there were two cards in the game’s grimoire that I had yet to unlock and could only be done by one thing. Because of this, I have dreamed of the accomplishment. Luckily, I have a friend who is just as much of a completionist as I am and is a whole lot better at the competitive multiplayer in Destiny that I am. He and another one of my friends who comes from a Halo background have been my fireteam members in Trials when I put my toes into the water these past few months. Yet, it took one failure to lead us onto a path that would end in victory. Late this past Saturday night, my clan was doing the Wrath of the Machine raid. We steamrolled to the end, but once again hit a little bit of a wall at the final encounter. We felt like our DPS wasn’t good enough, and the RNG nature of one of the mechanics was starting to tilt us. The decision was made to just go ahead and do something else instead of bashing our heads against it, even though we came to find out that we were doing just fine and could have probably finished. We decided to split into two teams to do some Trials in the hope of getting some better gear. My usual Trails team broke off, and the other three started their own run. Our first run went about as expected, we won our first few games but then hit a streak of bad luck and bad play against good teams. It wasn’t long before we saw ourselves out and buying passage into a new run. With the sobering reminder that we could easily be beaten, and what some of our weaker decisions had been, behind us, we started anew. The first few matches were once again completed without too much trouble. While my two friends are pretty good at Destiny’s multiplyer, I would say that I’m only about average. I think my overall kill/death ratio is around 1.16, but I’d have to check again and that doesn’t feel like something that would be very self-inspiring. It was after we hat hit 6 wins that the thought started to drift into our minds that we had a chance. We had come this far before, only to meet teams that would completely destroy us. Yet, we didn’t give up. The seventh game will be one I remember for a while. These guys were good, and they weren’t showing us any mercy. For each good play we’d make, they’d make one back. When we would lose a man, they would push, and we would do the same against them. After eight rounds it was 4-4, and the next round winner would move on with the victory. We spawned and moved into position. Plays were made, and soon it was two of us versus one of them. However, it was close quarters and only my other teammate was geared for this. I had been playing as our sniper, so when I saw my teammate go down to a shotgun all I could do was use my primary as the enemy charged. His health melted as I emptied my Grasp of Malok pulse rifle into him, but the dastardly range of shotguns in Destiny won the day. From my perspective, he had literal pixels of health. Just another fraction of a second would have seen me on top. Yet, that didn’t matter because they had won and we had lost. Teabagging ensued, and with it, my spirit dropped a bit. We had lost our Mercy and now would have to go three games without a loss if we wanted to go to the Lighthouse for the first time. I reigned in my emotions and self-doubt, and we went into the next game. It was tough, but we managed to win the next two games through what seemed like our pure force of will. It was at this point that Nate, my friend who is the best out of all of us at PvP and also dreamed of going to the Lighthouse, sat up in his chair. He hadn’t really gotten too hyped throughout our run because, according to him, he didn’t want to burn out his energy. Yet, this was it. This was the final game that would decide everything. We either won here or would see the closest chance we had yet seen slip away. Looking back on it, I wasn’t as nervous as I thought I would be whenever I theorized being in such a position. We were focused, and our teamwork and strategy had been focused down through tough engagements. We knew how to win from either spawn, we just had to execute. Callouts were made, and before long we were up 4-1. We just needed one more good play. We were being pushed hard. One of their players with a shotgun had rushed me, and as the sniper there wasn’t much I could do but try to pull off a cheeky quick scope, fail, and run down the broken down escalator behind me. My two teammates were still up above dealing with the rest of the enemy team, and I had full faith in their abilities. As I ran I heard them call out that one of the other players as down, but I knew that if the shotgunner got me and was able to flank, we would be in trouble. Without thinking I turned around and used my super ability, a nova bomb, down at him as he fired his shotgun into my gut. I died from the blast, but not before he was vaporized into void energy. I called out the kill and directed my teammates to push the final player. They did, and we won. It wasn’t clean, but it was a victory. It wasn’t until the announcer told us that we had won that it really sank it; we were going to the Lighthouse. To say we were hyped would be an understatement. Maybe a mere hour before I had referenced us as the Jamaican bobsled team of destiny, and summarized our Trails experience with this classic scene, and maybe only a few hours since failing in the raid when we could have pushed on, but now we were basking in the sunlight on Mercury, seeing a sight that we never thought we would see. I didn’t get to sleep until 4 in the morning because of the adrenaline running through my system. I know there are a lot of people who go to the Lighthouse many times every weekend when Trials rolls around, but that’s not us. We’re just a bunch of friends who finally made it through teamwork, dedication, and a little bit of luck. I know that this success will make me more eager to participate in the Trials of Osiris more often, even if we don’t end up going back to the Lighthouse for a while. Simply, the feeling of standing by your friends and finding the force of will to succeed can do amazing things. It dawned on me while writing this that my last post was exactly five months ago. For weeks I’ve been meaning to start writing again once time allowed, but it never does. I would say to expect more content on here, but that’s become a sort of cliché for me. In these next few weeks I’ll be doing my best to provide commentary on topics relevant and important to me, most likely Destiny related. Thanks for reading!